story PHIL HESTER art ROMANO MOLENAAR cover B TODD McFARLANE LANDMARK ANNIVERSARY ISSUE! 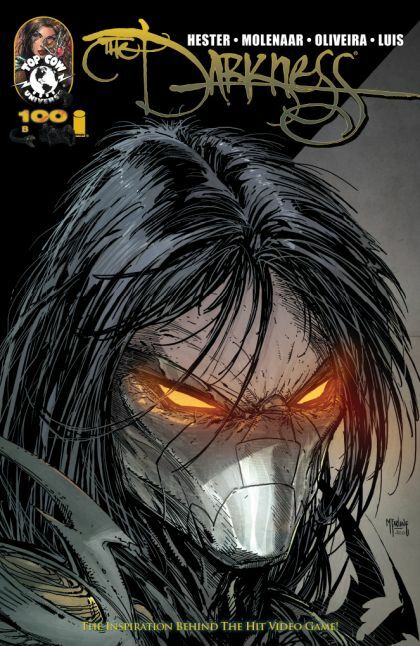 Just in time for the release of THE DARKNESS II video game from 2K Games and Digital Extremes, Top Cow proudly releases the over-sized 100th issue of one of their flagship characters. Long time writer PHIL HESTER (Wonder Woman, Green Hornet) concludes his epic run on the series with artist ROMANO MOLENAAR (THE DARKNESS II : CONFESSION) as Darkness bearer, Jackie Estacado comes face-to-face with the source of his power and misery - the Darkness itself! And only one of them will walk away? Featuring covers by such lumineries as TODD McFARLANE (SPAWN) and MICHAEL GOLDEN (The Nam, Micronauts, SPAWN) alongside THE DARKNESS artists JEREMY HAUN and MICHAEL BROUSSARD!